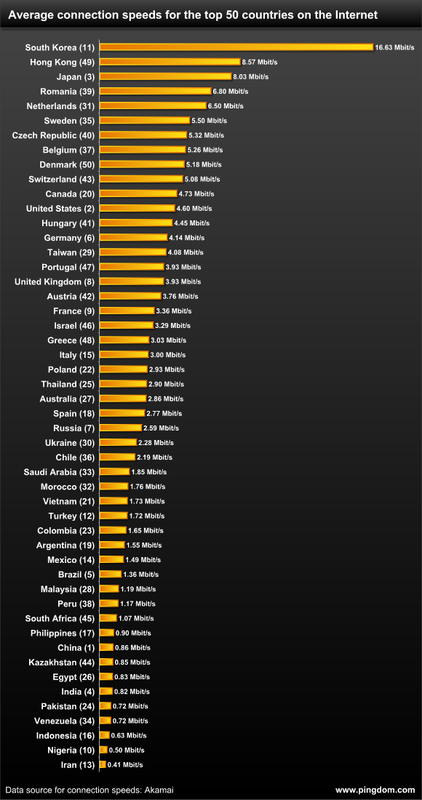 Below is a bar chart showing how fast the Internet connection is in different countries around the world. Korea looks pretty impressive. It is roughly 15x faster than the last country on this list, 3.6x faster than the US, and 6.4x faster than Russia. Of course, both countries are much larger in size than Korea, but still. Perhaps we need to take the surface area into account. It looks to me like the top 10 countries on this list are pretty small. Imagine providing the same high-speed service over the extent of the huge territories of Russia, Canada, Brazil, the US, and China? Probably, it’s harder to do than in the Netherlands or Hong Kong. This entry was posted in Data Analysis and Visualization and tagged connection speed by country, internet connection speed ranking, The Internet Speed by Country. Bookmark the permalink.